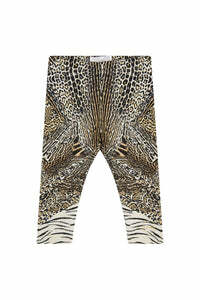 A devotion to Camilla's spiritual awakening through meditation, The Bodyguard High Waisted Flared Trouser evokes the fierce jungle creatures of India with an opulent, hand-painted print. Blissfully comfortable, these statement animal-print trousers feature a high waisted design, contoured flared silhouette and decadent crystal details to unleash those free-spirited gypsy goddess vibes. Fierce yet peaceful, The Bodyguard is a print found in the depths of reflection inspired by exotic creatures and ancient folklore of India.